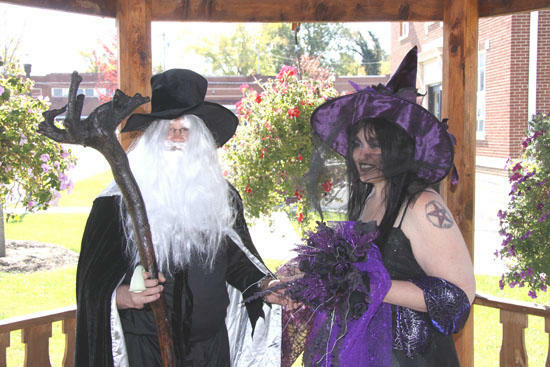 'Witch' Theresa marries Brian Kidwell outside the Cannon County Courthouse Monday. Halloween 2011 has officially gone down as the day a witch got married in Woodbury. At a little after noon today in the gazebo outside the Cannon County Courthouse in Downtown Woodbury, Theresa and Brian Kidwell entered into wedlock -- or perhaps "witchlock." Woodbury Mayor Harold Patrick performed the marriage ceremony. He said it was the first time since he began performing marriages in 1975 that he had conducted one involving a witch. Therasa said she's a Pagan and is "very much into nature and education." She said Pagans mean no harm to anyone and don't mock the religion of other people. "I believe if you harm anyone it will come back at you tenfold," she said. Theresa added there are more Pagans around than people might think but said they are "too afraid to speak up for fear of people attacking them for their beliefs." I think this is very cute! What a great fun idea! I hope you have great success as husband & wife! Very cool!